When analysis needs to be used by decision makers that didn’t create it, the communication of the information and the message it conveys becomes critical. There is a plethora of ways to layout reports and dashboards, even within a single company. Enter the SUCCESS formula, that “lightbulb” moment. Introduced by the IBCS Association (International Business Communication Standards) the SUCCESS formula provides conceptual, perceptual and semantic rules that enable faster, better, and less-costly results in all stages of business communications and decision-making processes. This webinar will introduce the 7 Rules of SUCCESS that provides a toolkit to aid analysts in designing their visualisations for better reach and decisions in their target audience. The webinar will also introduce The Philips journey to implementing IBCS principles in their global "Accelerate!” Initiative. Steve Adams, Senior Consultant, Visual DJ, Ltd. 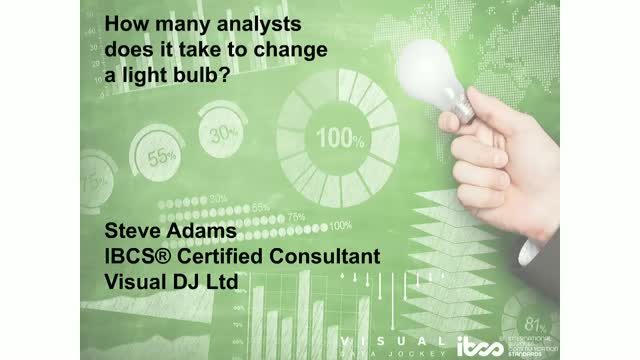 Title: How Many Analysts Does It Take To Change a Lightbulb? Presented by: Steve Adams, Senior Consultant, Visual DJ, Ltd.